It’s easy to observe that some Filipinos don’t like work. Gogs wrote about why Filipinos don’t value work. Filipinos are afraid of failure before success and just want to become famous without any effort. But aside from that, I see a few other things about Filipino views toward work that may affect how they make decisions in life and are among the bigger reasons our society remains backward. Indeed, as GRP’s logo implies, we believe it is the biggest reason. 1. Work is shameful because it puts you in the lower class. Even today, Filipinos still hold the same outdated ideas of the 1800s, or earlier, specifically class ranking and master-servant relationships. As webmaster Benign0’s astute statement puts it, “Filipinos are culturally hobbled by a compulsion to assert class dominance over the other.” We buy things, say things and do things because we want to be greater than our fellow man. And we like to avoid work because we believe that’s a trait of being greater than one’s fellow man. It goes back to the point Gogs made: Filipinos like to become famous without any effort. They feel as if this it is a necessary thing to be served or idolized by others. It’s perhaps part of the survival instinct that seeks subjugation of others if elimination is not possible. Perhaps it’s part of the needless search for validation, and in the wrong places. 2. Work is unnecessary. The Smiths song has the saying as a title: Work is a four-letter word. But even the song says that attitude should be dropped. Change your life, there is so much you can do with work. Not for Filipinos, though. If you recall the My Family’s Slave article by Alex Tizon, that represents the strong wish of many Filipinos – to just be served. We like having slaves because we believe we don’t need to work, and others should give our comforts to us. Thus, we become disrespectful of and contemptuous toward others. This is why Filipinos remain impoverished. Simply speaking, to get a glass of water, one has to stand up, go to it, pour the water in the glass and drink it or take it with them. Filipinos seem to want the glass to fly over to them, or at least the water flaying to their mouths. Since supernatural powers aren’t real, the next best thing is a servant. They just don’t like the work even to get a glass of water. Problem is, they’re not likely to get such servants, and are perhaps disappointed that reality won’t fit their wishes. 3. Work is difficult and is seen as “hirap/pain.” Some believe when you endure pain, even if you’re not making any effort to fill a specific objective, it is considered work. Filipinos like to avoid pain, so they want to avoid work. Hence the song “Magtanim ay di biro” (Planting crops is not a joke). But indeed, having no work to do is not a joke either. Some workers may also seek payment even if they did not finish anything as required, claiming their “hirap” or hardship in working is enough for demanding payment. In that case, they were not working, but were just pretending to work. There’s the other explanation on why we like having slaves. We like to pass our “hirap” on to them, escaping the reality of toil and pain. But that is why Filipino society is in the pits. Refusing to accept reality and deal with pain head on leads to the many problems with laziness, corruption and more. 4. Ordering people around can be work. Some people dispute that this can be true. Yes… and no. Because Filipinos, in their quest to get away with abuse, will rationalize that giving orders to others is painful. Such Filipinos may complain, it’s so hard to order people around because people won’t follow you and may have excuses. Yes, perhaps some of the people you may be ordering around also refuse to work. But ordering around people isn’t the real work as a manager. It’s examining things, doing your legwork to get the facts, processing them in your mind and thinking of solutions. Ordering people around is less of the work because you’re already delegating the work to others. Even if you give orders, you still have to supervise them. 5. Work is a curse. This is probably based in part on misinterpretation of the Genesis story in the Bible. After the fall of man, God says in effect, man shall toil by tilling the soil. Some might take this to mean, if the fall didn’t happen, people were never meant to work and were supposed to receive manna from heaven. Then they just laze and eat away. Even in standard Protestant circles, this is disproved as wrong. But perhaps even without this, people may come to consider work a curse. This is another thing to disprove. Work is no curse: it is a reality. Get up and pour into the glass to quench your thirst. Or build a contraption to bring it to your mouth (at least you worked in doing that). Work is a necessary act everyone must do to fulfill basic needs in life. Of course, I acknowledge it’s a problem in all countries and societies around the world. With Filipinos, though, we seem to make it part of our national identity. This also does not dispute that a lot of Filipinos are good workers because they may enjoy the work they do and refuse to believe in the above myths. Some realize that busting one’s muscles is necessary to live. “Magtanim ay di biro… pero kailangan pa rin magtanim (Planting crops is not a joke… but you still need to plant).” It’s sad though that the people who hate work are the ones who insist the dutiful workers become their ATMs. Perhaps it’s time to finally them off. Tell Filipinos that everyone should work, and being hacienderos with servants is a bad thing. That should lead to increased awareness and acceptance of personal responsibility, which will in turn lead to better community building. If I dont want to work, I dont see any point in going to school. Not even Kindergarden. So what does work mean to me? It means, I can finally test my own talents and how far it will bring my talents. Am I cut out to be an average engineer or can I grow (develop myself) to become a good – or the best – engineer? This is not about being better than my collegue(s); it is about getting the best out of myself. In return this will be rewarded by getting paid a good salary. And with that salary I can make my life very comfortable. Good for you. At least you do have a good reason for working. Your summation, in relation to your article’s point, confuses. There seems to be more about the dynamics what the social economic climate that’s being made available and what the administrators of this society is (in)capable of handling and offering than it is about the actual attitude of the people regarding how they value work. Are Filipino people here do not want work or they could not find available work? Why are there so many OFWs around the world? So what confuses is which section in our society actually represent us as a people in terms of who actually dominates. With the word “people”, are you referring to the “masa”, the conyo, the ruling elite or the people in government? 1. Work is shameful because it puts you in the lower class. 4. Ordering people around can be work. There’s a link where “national identity” is that explains it. And breaking it up according to classes doesn’t matter. Rich, middle class or poor would all manifest the above attitudes in one way or another. We all were brought up, on the “Haciendero / Senyorito and Haciendera and Senyorita” mentalities. Work to us, is putting yourself on the level of the Filipino Indio. In other countries, like the U.S., there is : Dignity of Labor. We work to accomplish , and earn our livelihood in the honest way. We can see Politics, is a very profitable field,in our country, because; all you do is scam people to vote for you. Once , you are in government position. You can steal and get rich. Being a “kurakot” in your position is a pathway to riches. There are many “istambays” in our country. When, I go to some Provinces; there are many uncultivated lands, with cogon growing on them. We envy other countries, bu we can see that almost all arable lands in those countries are planted with crops. Filipinos are not innovative; and would not want to improve their tools, equipment and other gadgets that they use in life. We can see this, by the Jeepney Driver’s strike that we have. Jeepney Drivers and owners, do not want to improve their vehicles, as long as they can earn money. They don’t mind, that their vehicles are : fuel inefficient, obsolete, unsafe, and is a rolling coffin on the roads. The mindset of Filipinos must change. If, we ever want ourselves to progress ! Dignity of labor just doesn’t seem to register in a culture that abhors work at all. The American attitude comes originally from Prussia, what is today northern Germany. Work made someone honorable and the harder and smarter you worked the more respectable you were. That fuels sexual selection and men who didn’t do anything with their lives didn’t get a chance to mate even if they had some money. I don’t see this in the Philippines, so the genealogy of the tambay is continued – plenty of guys drinking on the corners who get money from the wife, relatives, parents and then have a litter of kids. If women completely disregard these guys, things might improve in the future. The other problem is the culture of disliking change, as you pointed out. Dynamic societies that embrace science and progress tend to be wealthier and overall better places to live in, stagnant societies based on religion stay troubled because they are sticking with traditions, whether those traditions make sense and help people or not. Religiousness has an inverted relationship to intelligence and wealth (as per the research into the subject) but I can’t say this in the public because I’d get stoned to death, figuratively. Work itself is not a curse. God told Adam to keep the garden of Eden, that means work, toil, and more work. The unpleasantness and disappointment of working for little or no reward is the curse. How Can the Philippines Achieve Progress If FLIPFAGs Ignore EVEN SIMPLE TASKS Such as Cleaning the Place Up?! The Sad Fact That Menial Labor Is Belittled By Failipinos! Interesting stuff. I’m sure you could make a whole book full of articles based on this topic. The question is what was life like in the Philippines pre-colonial days? The population was significantly smaller (1 million or less?). Life was simpler. Natural resources were abundant. Perhaps when hungry, one simply picked fruit from trees or speared fish in shallow waters. There was no shortage of food. There was no reason to store. Food was plentiful. 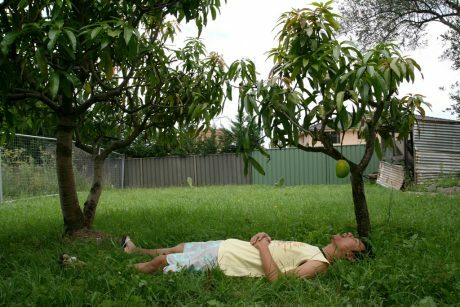 Perhaps, as the picture above depicts, one could just lay under a tree with mouth wide open to catch falling fruits (not advisable under coconut trees). Could this scenario be the origin as to why there is a dominant lazy attitude in the culture — a remnant behavior from the distant past and from a culture and environment that no longer exists? Yes, and in places where there are harsh winters within which time food is scarce, only people who learn to plan and store food in advance and work hard to accumulate surplus during growing seasons survive. In contrast, in environments such as the Philippines’ there was no need to develop a tradition of applying those kinds of planning and organizational skills. That theory’s in another article here somewhere. How the colder nations tend to lead to more industrious societies because of their unforgiving environment, while warmer countries tend to have plenty, and so lead to lazier people. A theory attributed to Montesquieu. I’d agree that generally, Filipinos today having the same flaws as they had during the pre-colonial era is a big part of the problems of the country, so shedding part of Filipino pre-colonial nature is a solution. Today, I’d think mass media even from foreign countries is helping foster this dependence mentality, by brining in their versions of laziness. Maybe the occurrence of foreign aid is another factor, as Benign0 explained in many of his articles. Then we have Singapore as an example of a nation that overcame that “lazy” nature of being in the tropics to become a more disciplined and successful country. EDIT: One other thing I forgot is this culture we have wherein, for example, if some teens have a baby but they don’t want to work to take care of it, they’re entitled to have someone else take care of it. Basicallly, when someone makes a mistake, someone else cleans up their mess. That culture of “tagasalos (catchers)” or “assistance” emboldens more people to be irresponsible. Perhaps this should be cut down, so that when people realize no one else can “catch” their problems for them, they will have to do things themselves. We need a more DIY (do it yourself) attitude in our society. Thanks for the reference. It all boils down to this feeling of entitlement that pinoys have that many of us discuss. You can hear it or not hear it in what they talk about and not talk about. You rarely hear the regret being I should have worked more , I should have tried harder. The fault is always out there. It is never in here. The beauty of the fault being within, is that it is the one thing we control the most. Ourselves. Well said. Come to think of it, after years here, I’ve never ever heard anyone blame themselves for anything. Statistically it’s unlikely that it was always someone else who was at fault.